Okay, well here are the entries so far in the NAMING CONTEST for daughter Emily’s TWINS. 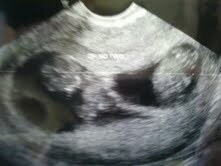 (See “I’m Having Twins!” 2/5/12.) Emily is still insisting that she is going to be the one who names the twins; I just don’t know what I’m going to do with her. And even though the HGTV Dream Home Contest is now closed for entries, we are not. Send more suggestions! I don’t mean me literally, of course. Really, how gullible are you? Actually I will be the grandfather of TWINS (!) sometime in August. My younger daughter Emily gave us the exciting news a few weeks ago. I simply didn’t believe her at first. There are no twins in our family that I know of (although one time I saw a guy in Taos, NM, at a teacher’s conference who looked amazingly like me). They are about an inch long here. But what strikes me most is how intelligent they already look. 1) Emily has always been strong-willed (her first words were “no way”) and for some reason SHE wants to name the babies, like I’m not a university professor and all. 2) Then there’s the issue of whether the twins will be two girls, two boys or one of each (which in a way seems like a better deal). 3) You have to decide if the names are going to rhyme (Roy/Coy) or not (Sylvia/Gertrude). If I had a twin (and some folks believe we all have twins out there just waiting to be reunited with us–of course, most of those same people were simply devastated when Oprah ended), I would not want us to be named something so rhymingly predictable as Neal/Bill. I would want his name to be cool and hip, maybe Creel or Steele. If Emily’s twins are a boy and a girl, my first thoughts were Neal and Nealy. But a problem with that is my first grandson Daniel (see “Introducing Mr. Happy” post) already has the middle name Neal. Could I have two grandsons with the same name? Maybe. It’s 2012. Two girls? Nealy and Nell. Two boys? Neal and Niels. I hearby open up a contest to help name the twins. Like the HGTV Dream Home Contest, you can enter as many times as you like. The prize will be really, really cool and very, very valuable. Post your ideas! We only have about eight more months.